“You shall love the Lord your God with all your heart, and with all your soul, and with all your mind.” These words of our Savior, which we have just heard, are repeated at this parish everyday at every Anglican Use Mass. It is very good for us to hear these words at every Mass so that we are constantly reminded of our need to put God first by loving Him above all things; but, when something becomes so familiar to us we can develop a tendency to ignore its true meaning. What does it mean to love God with your entire being? This is a very serious question to which we must have the correct answer so that we can rightly order our lives toward God. But in addition, without the right understanding for the love of God we will not know how to keep the second of our Lord’s commands: to love our neighbor as ourselves. So, what does it mean to love God with all your heart, soul and mind? Before looking for the answer I want to address modern man’s take on this question. Why Do ‘They’ Hate Us? Although the ‘They’ listed in the title could refer to anyone that hates us, can also be seen as connected to my last two posts. As we start with this consideration of why people hate one another let us first consider what hatred really is. It seems to me that hatred is the effect of giving into the selfishness of being offended by the action of another. It is the desiring of evil to happen to the one who harmed us. (Whether or not the harm done was real or only perceived does not really matter. What matters is that someone feels slighted in some way and therefore hates the one who hurt them.) On the other hand, love is desiring the good of the ‘other’, even if they have harmed us. The reason we should rid ourselves of hatred is because we are not God. Hatred, it seems to me, comes from our desire to be the ‘God’ of our own lives, e.g., I don’t have things go the way I want them to and therefore I punish with my hatred the one who harmed me. (Not that I would or should do this – it is only an example.) It was the sin of Adam and Eve that introduced this disorder into the life of mankind. But the order that we were created for is that of love; a love based on God the Creator creating us out of love and for love: both love of God and love of those made in His Image: our fellow man. And this love, the love we were created for, is only possible if we live our lives in knowledge of the fact that we, the individual, are not God. We are creatures, who if we would act in love towards others as we were created to do, would see the true evil that lies within hatred. And as a result, we would no longer want to hate anyone. At least it seems to me this is the way that a Christian should see things. So in answer to the question of why do ‘they’ hate us: in regards to those Muslims who do hate us, perhaps it is something within Islam that causes them to see things in a completely different light than a Christian would. Of course that would not make it right for them to hate us but it at least would help us understand why they hate us. But I am not a Muslim scholar and do not know what it is that might make them see things differently than us. If anyone has the answer please feel free to say so. Just a few moments ago, as I was preparing to write, the bells for the Angelus started to ring. The Angelus has been a part of my life going back to the Episcopal seminary I attended. 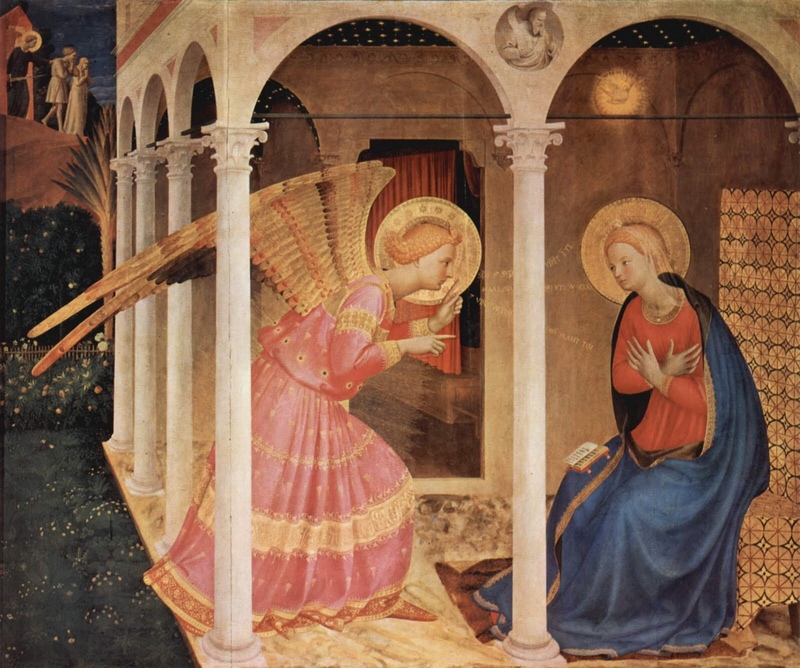 It was there that three times a day the bell would ring and everyone, no matter what they were doing, would stop and remember the Incarnation of Jesus beginning with the words, “The angel of the Lord declared unto Mary; and she conceived by the Holy Ghost.” And that angel was, of course, the Archangel Gabriel. And so it seemed to me very Providential today that the Angelus would ring out just as I was preparing to write about the Archangel Gabriel. Specifically, my purpose today is to make an important point in regards to my last post. That being said, we must ask how does the ‘religion of peace’ relate to the Archangel Gabriel? Well, I would say that he does not relate in the least to Islam, which I will explain below. But Islam, on the other hand, has something else to say in regards to Gabriel. Before we get to the Muslim belief on Gabriel, let us recap the Christian understanding. Gabriel appeared to the Blessed Virgin Mary and announced to her the coming of the Son of God, and that she was to be His mother. Mary accepted this very special vocation from God by agreeing to God’s plan and she conceived through the power of the Holy Spirit. The Old Testament prophesied about this event and the New Testament consistently expresses that Jesus, the Son of Mary, was and truly is the Son of God. Even Jesus Himself confirms this in the Gospels. And all of this was announced by the Archangel Gabriel. Now to Islam: Muslims believe that it was the Archangel Gabriel that appeared Muhammad and revealed to him Islam. They believe that it was Gabriel that dictated the Koran for Muhammed to right down. But, the Koran says that even though Jesus was indeed born to the Virgin Mary, He was only a prophet and not God. Therefore we are left with two religions claiming contradictory things about the same angelic being. Common sense dictates that it is not possible that Gabriel came to Mary announcing the birth of God's Son and also came to Muhammad saying that Jesus was not God's Son. There is only one option: one of the religions is true and the other is a lie. 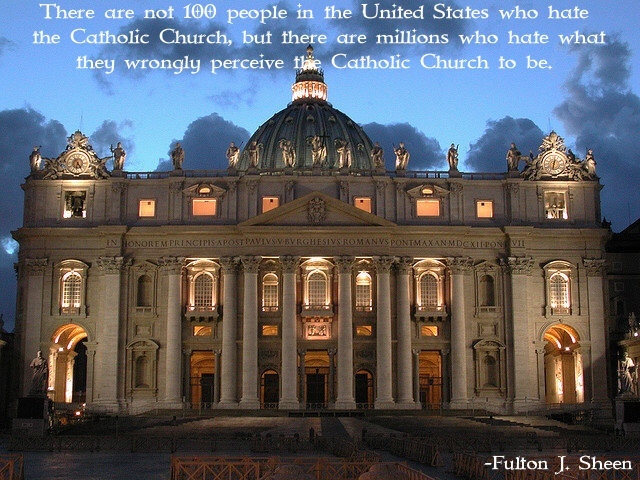 As a Catholic priest I am sure you know with which religion I side. Now this isn’t to say I don’t believe an angel appeared to Muhammad. It is entirely possible that an angel did appear to him. But, we must remember that there are two camps of angels: those who chose to do God’s will and those who did not. The angels that serve God would not say anything contradictory to the Truth; in other words, they would never lie. And so Gabriel could not have appeared to both Mary and Muhammad. But, there are a group of angels which would have no qualms whatsoever about lying. In regards to the leader of these angels Jesus said, “he is a liar and the father of lies.” This would be none other than Satan. This is the reason that I called Islam an evil religion in my last post. It is a religion that is based on a lie that says that Jesus is not the Son of God. But, and this is very important, notice that I said it is the religion that is evil – not the people within the religion, at least not all of them. Yes, there are many within Islam that have done terrible, awful, and evil things, but that doesn’t change the fact that all Muslims, Christians, Jews, and everyone else on this planet were made in the image of God and Jesus Christ, the Son of God, died for all of them on the Cross. He desires that all be saved. Therefore, let us remember that Muslims live within a lie and then do what we can to show them the Truth. And let us not hate them like so many of them hate us. Instead, let us pray for their eternal souls remembering that we too need prayers for our own. Perhaps you have heard this story before but not perhaps from St. Bede the Venerable. This passage starts on page 86 of the pdf, which is numbered 74 in the text of the book. The whole book can be found here for free. I have always thought this to be a wonderful story. I suppose the main reason I find this story so intriguing and inspiring is because it led to the salvation of the English people, which is very important for me as an Anglican convert to the Catholic Faith. 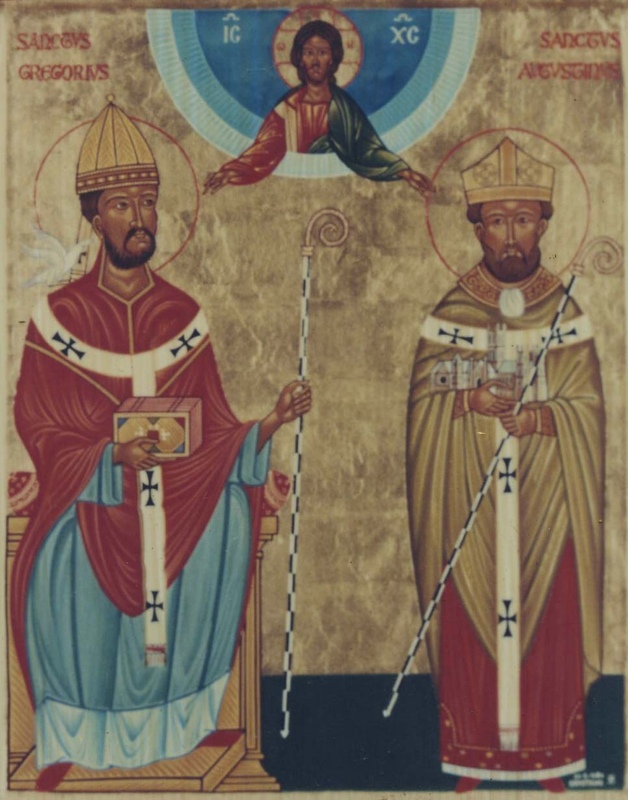 But of course there would be no ‘Anglican’ if St. Gregory had not first sent St. Augustine, which eventually led to Anglicanism after Henry VIII. So it is very appropriate that as Gregory sent Augustine to preach the Catholic Faith to the people and bring them into the one Fold of Christ, so also Benedict XVI published Anglicanorum coetibus to bring the lost sheep of Anglicanism back into the one Fold originally proclaimed by Augustine. But there is another reason I am bringing up this story today. Notice what happens when Gregory sees the Angles being sold in the marketplace. His immediate and primary concern is not to see the slaves freed from their physical chains that hold them down. Instead, he is focused on another slavery that is far worse – that of being pagans, of being completely and hopelessly lost without a knowledge of Christ. It was the chains that enslaved their souls that he sought to free them from because it is those which have eternal consequences. Many people today though have it completely backwards. They might see physical chains of some sort, some form of ‘social justice’ that needs to be performed, and through mere sentiment they seek to put right the perceived wrong. But of the spiritual situation of those in need they could not care less. This mindset is at least understandable in relief work done for the needy through various non-sectarian agencies. But when this is the attitude of those within the Church it makes no sense whatsoever! Our Lord died to bring eternal, not temporal, salvation to mankind. This isn’t to say that we should not be concerned with the physical needs of our suffering brothers and sisters. We should – in fact our Lord demands it of us. But, we must have our priorities straight and remember that the help that others need most desparately, more than anything else, is not ‘justice’, whether it be social or otherwise. Instead what they need is mercy – the mercy that we can only receive through Christ’s redemption that He won for us on the Cross. St. Gregory understood this and we, as a Church that can see pagans of all kinds surrounding us, need to understand it. There may be some Catholics, though, that are hesitant to learn about this part of our Catholic Faith due to the fact that most of the progressive (heretical) element within the Church comes from the ‘Social Justice’ crowd. (That being those who think that the only part of the Faith that matters is doing works of ‘social justice’ even to the extent of contradicting the clear teaching of the Church: for example the religious sisters who work as escorts for women coming into Planned Parenthood to have abortions.) But such people are not truly practicing the Faith. Jesus came to bring us life everlasting through His own Passion, Death, Resurrection and Ascension and bringing others to a saving knowledge of Him is our primary duty as Catholics. But, Jesus also stressed the need to care for the ‘poor’, which includes those who suffer from lack of money or some other form of poverty. And one of His most stark teachings on this is the Parable of the Sheep and the Goats where He says, “Depart from me, you cursed, into the eternal fire prepared for the devil and his angels; for I was hungry and you gave me no food, I was thirsty and you gave me no drink, I was a stranger and you did not welcome me, naked and you did not clothe me, sick and in prison and you did not visit me.” Therefore, we would do well to listen to the words of our Lord. But in addition to the words of Christ, we must remember that God sends us saints to help re-direct our attention to and deepen our understanding of the Truths of the Faith. And even though he lived about 800 years ago I think St. Louis’ words can really help us in our own understanding of Catholic Social teaching. Be compassionate towards the poor, the destitute and the afflicted; and, as far as lies in your power, help and console them. Give thanks to God for all the gifts he has bestowed upon you, so that you will become worthy of still greater gifts. Towards your subjects, act with such justice that you may steer a middle course, swerving neither to the right nor to the left, but lean more to the side of the poor man than of the rich until such time as you are certain about the truth. Do your utmost to ensure peace and justice for all your subjects but especially for clergy and religious. The rule for all of us is perfectly simple. Do not waste time bothering whether you ‘love’ your neighbour; act as if you did. As soon as we do this we find one of the great secrets. When you are behaving as if you loved someone, you will presently come to love him. If you injure someone you dislike, you will find yourself disliking him more. If you do him a good turn, you will find yourself disliking him less. There is, indeed, one exception. If you do him a good turn, not to please God and obey the law of charity, but to show him what a fine forgiving chap you are, and to put him in your debt, and then sit down to wait for his ‘gratitude’, you will probably be disappointed. (People are not fools: they have a very quick eye for anything like showing off, or patronage.) But whenever we do good to another self, just because it is a self, made (like us) by God, and desiring its own happiness as we desire ours, we shall have learned to love it a little more or, at least, to dislike it less. This is from the Gospel reading for Mass today. For me, just hearing these words brings an immediate peacefulness to my soul. But when I look at the situations in which I usually hear or read these words I must take notice of something: it is usually at Mass or at prayer that I come across these wonderful words of our Lord. But both of those are times when you are not having to do a multitude of things; instead, you only have to be still and put yourself in the presence of God. But this is not the peace of which our Lord speaks. The peace that our Lord wants for us is not simply the absence of those distractions and happenings in our life that can take away the calm demeanor we might have when things happen to be going our way. (Like when we can leave all our cares behind for a while when at Mass or at prayer. Or even at other times: when on vacation, a day off from work, etc.) Instead, the peace He wants for us can be ours at all times – even when it feels like we are caught in the middle of a violent storm. To understand the peace that Christ wants to give us we must first understand what the world understands peace to be. Peace for the world is simply the lack of violence. For instance, think of the Middle East: when people call for peace amongst those countries what they mean is for the people in those countries to stop killing each other. But this is not peace – it is only a lack of violence. Even if they are not killing each other the people in those countries still hate one another and in times of ‘peace’ the least thing can set them off and they will be killing each other once again. So we find that it is hatred that is at the root of the world's lack of peace. And the virtue needed to correct this lack of peace is love; but love is only possible if there is forgiveness. But, due to the fallen nature of mankind, there can be no true forgiveness amongst the various peoples of the world without the forgiveness that comes first from God. It is true that people can forgive one another and live in relative peace for a while. But, because of our tendency to sin, if we lose or have never known the forgiveness that comes to us only from God then we will inevitably come back into conflict with the people with which we formerly had peace. So, how do we obtain this peace that Jesus promises us? It comes to us through the forgiveness we receive from Him through His one and only perfect Sacrifice on the Cross. When we are born into this world we are born into Original Sin and therefore, we are alienated from God because sinfulness can have no place with God Who is all good. Therefore, because we were created by God and for God, we can never be at peace, whether with God, within ourselves or with others, while we are alienated from Him. God, though, has rescued us from this alienation through the perfect Sacrifice of Jesus Christ on the Cross. And it is through Baptism that we participate in Christ's Sacrifice: we are buried with Him and rise again to a new life – a life of Grace. Through this Grace, which is God's very life that He puts within us, we are put into a right relationship with God. We are therefore no longer alienated from Him. Having been created to be with Him our lives are necessarily disordered, which means there can be no true peace, until we are brought out of that alienation. Once we are made right with Him then peace within our souls is restored because we are at peace with the One who created us. But, of course, this state of Grace we have received through Baptism can be lost if we mortally sin – meaning that through some serious sin we deliberately and with full knowledge of the wrong done turn our back on God. When that happens then the peace we had is lost – until we turn back to God for forgiveness through the Sacrament of Penance. But in connection with the forgiveness we receive from Christ we must remember His own words of warning, “if you do not forgive men their trespasses, neither will your Father forgive your trespasses.” (Matthew 6:15, RSV-CE) The logical conclusion then seems to be this: if we want peace with God, with others and within ourselves – that being true peace and not just the absence of conflict or strife in our lives – then we must forgive others just as God has forgiven us. Love the Sin – Hate the Sinner? Satan hates us and wants to drag as many of us to hell with him as possible. When we think such evil thoughts in regards to those who offend us then we are effectively doing the same thing: we are sending people to hell with our thoughts. But is that what we really want to do? Do we really want to condemn people to an eternity of despair and pain for a momentary pain they may have caused us? (And any pain in this life is only momentary.) If we really want someone to go to hell then we have probably condemned ourselves to the same fate because we have become just like Satan. But I think for most of us, if we really thought about the consequences of our evil thoughts toward others, we would see that in the big scheme of things what has been done to offend us pales in comparison to our wrath at the offense. So the next time someone hurts us we should try to remember that that person has an immortal soul created and loved by God every bit as much as He loves our own. And if we desire to be happy for eternity then let us emulate Him when we are hurt. Yes, we should hate the sin because sinfulness can have no place with God. And we should then love the sinner with the realization that the sinner is our very self.